It was a hundred years after the founding of this country, and only eleven years after the end of the civil war, that a man of African descent first earned a PhD from an American university. His name was Edward Bouchet, and he made history when he graduated from Yale with his PhD in physics in 1876. Despite being effectively locked out of academia and research at any institution that wasn’t specifically for people of color, Bouchet became a trailblazer and a role model, serving as an educator for most of his later life, a living example of what America was struggling to become in the post-reconstruction era: a place where merit and dedication are rewarded regardless of who you are. Now, as black history month draws to a close more than a century later, the question bears asking: How have we, as a society, done? How would Bouchet feel, seeing the state of physics education—or higher education in general—among minority students in this country? The uncomfortable answer is that he’d likely be disappointed…but probably not surprised. We’ve made strides, we’ve had an African-American president, one who was educated at Harvard Law—but Bouchet of all people would know that being the first to clear the hurdles of systemic racism doesn’t necessarily push those hurdles any lower. The second African-American to be awarded a physics PhD, a man by the name of Elmer Imes, didn’t get his degree until 42 years after Bouchet. to get a physics PhD, looking disappointed but not surprised. Where Bouchet’s contributions to the field came mostly in the form of educating and inspiring students of color, Imes was a researcher. His early work involved analyzing the absorption spectra of gases, shining infrared light on simple two-atom compounds and seeing which wavelengths they absorbed. Every molecule has certain energies of light that it absorbs best, based on the resonant frequency of its electrons as they oscillate around the atomic nuclei. The gases that Imes was examining had previously been seen to have two additional absorption bands, one on either side of this resonant frequency. These absorption bands were wider than a resonant frequency band, and scientists attributed their presence to the different rotational energies of the molecules in the gas: a broad spread of rotation speeds would mean a spread of absorbed frequencies. However, Imes’ ingenious array of prisms and diffraction gratings allowed him to reach an unprecedented resolution in his experiments, revealing that the broad bands others had seen were, in fact, groups of 12 narrow bands each, spaced very close together. Although the finding contradicted the established explanation for these bands’ existence, it fit snugly with a new paradigm that was just gaining ground as the dominant theory—quantum mechanics. 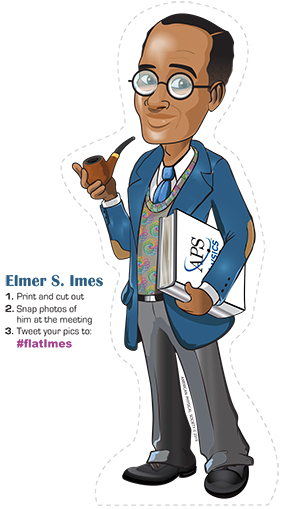 Imes’ name isn’t as well known as those of the theorists whose ideas he helped to verify, but he’s gradually being inducted into the “pantheon” of famous quantum physicists—and he’ll be featured as a kind of unofficial mascot (the “flat physicist”) at the American Physical Society’s March meeting this year. He’s not likely to supplant Neil Degrasse Tyson as the first name that jumps to mind when the average person hears “African-American physicist”, but that’s a hard title to take from someone who’s still alive and hosting talk shows. There’s another person, though, who might stand a chance of wresting that title from Tyson—someone who overcame even higher hurdles than Bouchet or Imes to appear in America’s living room last weekend: Katherine Johnson. You might recognize the name if you saw the film Hidden Figures, and you’ll know her face if you watched the Oscars on Sunday—she’s the real person who Taraji Henson’s character was based on in the 2016 film. Katherine Johnson was a physicist and mathematician for NASA, nicknamed “The Human Computer” for her adeptness at calculating trajectories and orbital dynamics. She was seen as a person of extraordinary talent, in a time and place where a woman—especially a woman of color—had to be exceptional just to be seen as competent. But Johnson’s accomplishments stand on their own, regardless of the opinions of those around her: she did the math that guided the first American into space, and plotted the course that would carry Apollo 11 to the moon. Without her, it’s possible we wouldn’t have won the “space race”. Johnson’s legacy is already serving as an inspiration to young men and women everywhere, which is precisely what we need right now. Katherine Johnson onstage at the 2017 Academy Awards. In the modern day, African-American students receive just over 2% of the physics PhDs awarded in America every year, despite making up close to 13% of the population. The reasons why are tricky and multifaceted, but historical and economic oppression is a large part of it: since public school funding is often determined by the county's property taxes, and since African-Americans are disproportionately represented among the impoverished (who necessarily live in lower-value properties and communities), a disproportionate number of African-American students attend poorly funded or overcrowded schools early in life. The larger problem of racism being a part of our society and the public’s subconscious leads to that disproportionate poverty, but it can affect people more directly as well—if we end up internalizing the attitude that all the famous physicists are white men, those who don’t fit the mold might be less likely to pursue a career in the field. This internalized racism is subtle, but it can affect people’s confidence—which in turn affects their academic performance, a phenomenon known as stereotype threat. Nowhere is this more evident than among African-American women in physics—Willie Hobbs Moore, the first African-American woman to earn a physics PhD, didn’t do so until 1972. Overt discrimination aside, it’s uncomfortable to be the only person of color in a lecture, and sexism—internalized by teachers and students alike—compounds the problem: an unsettling number of the female scientists I’m personally acquainted with have, at one point or another in their careers, been told by colleagues that they’ve only risen to their current station because of affirmative action or other diversity initiatives. I’d say it’s a small wonder that African-American women are underrepresented among physics PhDs, but the extent of the disparity is still extraordinary. Between 1973 and 2012, roughly 22,000 white men earned physics PhDs in this country. Black women received 66 over the same time period. 66! This disparity is a symptom of a system that is failing its minorities and its women, a culture that ignores their potential or, worse, actively pushes them away. When a boy has a hard time in math class at a young age, he might think, “Wow, math is difficult,” or “I’m not very good at this”. A girl confronted with the same problem might think the same thing, but if she’s grown up on the stereotypes that math, engineering, etc. are for boys while girls are destined for more artistic pursuits—stereotypes that we start on pretty young—she might ascribe the difficulty to her gender. Some people would see a poor grade as a personal failing, and take it as a challenge to do better, to prove their competence, but when a child writes it off as part of who they are—“I’m just not a science person”—they’re selling themselves, and the rest of the world, short. We have to work actively toward a more equal culture, one free of the disparities, economic, racial, and gender-based, that keep bright and talented young people from reaching their potential. Of course, social inertia and the complexity of these problems mean that they don’t have easy solutions, and this is why we need to pay special attention to the work of people who are minorities among scientists. It’s why we must make a point of celebrating the diversity in our culture, and being careful about what we teach our children. This is why Hidden Figures is such an important film: it’s bringing people who deserve to be recognized into the spotlight, letting a generation of young African-Americans see that there are real heroes who could do extraordinary things with a pen and paper, and who faced a lot of the same challenges they're facing. While we work to tear down the walls of systemic racism and oppression, it’s important that we remember to lionize those people who inspire us to vault over them.